An explanation of lasers and their uses from NIST's William D. Phillips, who shared the 1997 Nobel Prize in Physics for his pioneering work in using lasers to cool atoms to temperatures near absolute zero. Dr. Phillips leads NIST's Laser Cooling and Trapping Group, which continues to make fundamental discoveries in atomic, molecular, and optical physics, and is active in science education and outreach efforts. The Laser Cooling and Trapping Group is part of the Joint Quantum Institute, a cooperative venture of NIST and the University of Maryland. 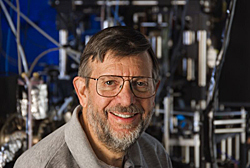 On February 21, 2010, Dr. Phillips will present a talk entitled "Laser Cooling and Trapping: Making the Coldest Stuff in the Universe" at a special seminar at the annual meeting of the American Association for the Advancement of Science in San Diego. Laser light travels through an optical fiber, built at NIST, possessing a special microscopic structure that helps produce large yields of paired light particles that may be suitable for future quantum communications. When the electrons are excited, they want to return to a low-energy state. As they do, the electrons release their excess energy in the form of photons, particles of light. Ordinarily those photons would be emitted in random directions, but in a laser something special happens. Some of the photons interact with other excited electrons and stimulate them to lose their energy and release even more photons in the same direction as the original photons. This light builds up in a cascading effect as the light bounces back and forth inside the cavity formed by the mirrors. If this amplification, or gain, outstrips the loss of light when it is absorbed by unexcited electrons or leaks out sideways or through the mirrors, the medium is said to "lase." Physicist Kris Helmerson observes a tiny glowing cloud of sodium atoms caught by six interesting laser beams. Such techniques produce the coldest temperatures in the universe--and may be the foundation for future standards of time, frequency, and length. A portion of this intense light can escape through the mirrors to make a stream of photons called a laser beam. 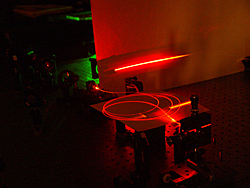 Most lasers produce light of one specific color (frequency) or a narrow band of very similar colors. Laser light has a special property called "coherence," meaning the peaks and the troughs of the light waves are matched up and travel in lock-step like marching soldiers. Because of this coherence, laser light can be focused to a very small spot or collimated into a beam that spreads very little as it travels over large distances, as from the earth to the moon. When lasers were first introduced, people considered them to be "a solution in search of a problem." No one then imagined the uses to which lasers would be put, but today lasers are nearly ubiquitous. Their special properties make lasers versatile tools for applications that include "reading" and "writing" information on data discs, music CDs or video DVDs; the global transmission of telephone conversations and data on optical fibers; scanning barcodes in supermarkets; sculpting corneas during laser eye surgery; and teasing playful cats with laser pointers. Lasers touch almost every aspect of modern life, from health care to entertainment and from manufacturing to communication. Lasers allow scientists to study the physics of solids, liquids, and gases from the highest temperatures to almost absolute zero. Usually lasers, like all forms of light, heat things up. But when properly tuned laser light is aimed at a gas of atoms, the momentum of its photons can nearly stop an atom in its tracks, like a stream of ping pong balls aimed at an oncoming bowling ball. As a result, lasers can cool objects to temperatures far lower than the coldest depths of interstellar space. By tapping into the counter intuitive properties of quantum mechanics—the rules governing the submicroscopic world—lasers are also enabling new forms of computing and methods of encrypting information. These quantum methods are potentially far more powerful than the conventional "classical" techniques widely used today. Lasers are just 50 years old, but they promise to remain key tools for exploring the frontiers of science and technology for many years to come.